Who Is Behind "Non-Partisan" Anti-Doug Ford Website? 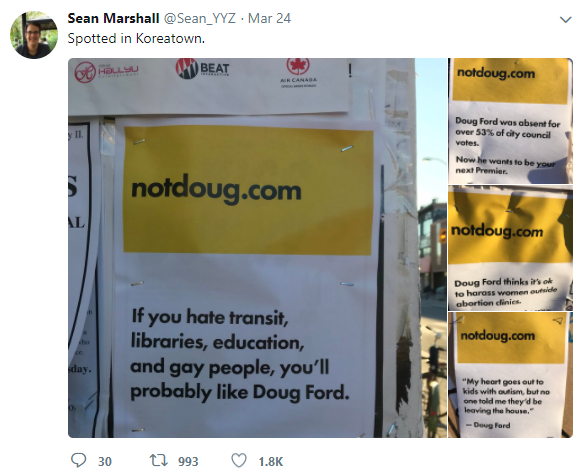 Who Is Behind "Non-Partisan" Anti-Doug Ford Website In Toronto? March 28th, 2018 | S.P. You may have heard of a new “guerrilla website” taking aim at Ontario's alternative to Kathleen Wynne, Doug Ford. It has been described by media as grassroots but, in this day and age, that explanation immediately raises concerns. There are very, very few grassroots creations that get noticed or publicized without some sort of coercion or concerted effort by people belonging to other, well funded organizations or media. “We are not affiliated with any political party, union, business, taxpayer group, or interest group otherwise,” the Not Doug team said via email. “It’s kind of funny seeing people talk about how we look like we’re backed by some greater interest; our campaign was built in hours on a laptop. A staple gun, some design skills and a printer helps, too,” they wrote. There is nothing at all wrong with remaining anonymous, but there is most definitely something wrong with claiming to be completely “grassroots”, or claiming to not have any particular special interests or affiliations to other parties, as the group also claims. There is something on Twitter that may give us the clues we need in determining whether this group and their website are, in fact, “unaffiliated” and not at all interested in seeing any specific party win Ontario's general election this June. 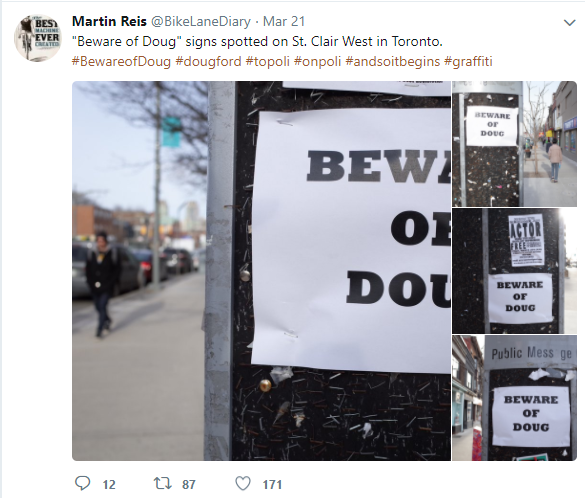 One of the better ways to find out who may be responsible for this so-called unaffiliated, grassroots start-up is to take a gander on Twitter to see who the very first people to “notice” the group's print-off posters posted around Toronto were. Who were these sly individuals who happened to stumble upon this new group's markings and tweet about them online right before the media caught wind? When complimented on the posters, Martin Reis replied with a “thank you” and a wink. This could mean absolutely nothing, but his willingness to take credit for the posters is worthy to note. Great to see @HeritageRambler @lloydalter @Sean_YYZ @AMatthewsdavid @DaniellaLevyP @shawnmicallef @todd_irvine @kbriegms and so many others at today's Die-In for Safe Streets at City Hall. All of this is merely speculation, peppered with a few pieces of coincidental and circumstantial evidence at best, but it would be wise to not assume that this new, upstart group that claims to have no agenda (other than to stop Doug Ford) has no other particular goals or affiliations. 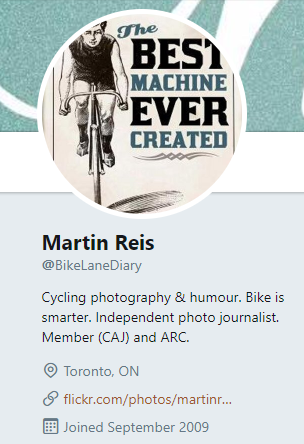 If—only hypothetically speaking—both Martin and Sean were indeed involved, we could trace the group's affiliations to Toronto's sometimes militant and very loud pro-cycling crowd. The same crowd that frothed at the mouth with chronic anger during Rob Ford's tenure as mayor and during Doug Ford's failed attempt to succeed his brother. Walk Toronto is yet one more militantly anti-Ford “group” or social media entity operating in and around the GTA. All of this, as I said, is mostly speculation based only on evidence and observations gathered from the public platforms that these users have chosen as their means to attack Doug Ford while advocating for more “active transportation” in Toronto—whatever that may mean. Media has noted that the group has not made any public filings as a third-party organization, but if and when it does, I will be readily available to pick it apart. Even if the individuals mentioned here are not associated with this anonymous group, we have a clear glimpse into what types of advocates have been most actively and zealously promoting the group's work in and around the GTA in their efforts to stop Doug Ford.